Both Brown and Sanders are splitting reps — for now. 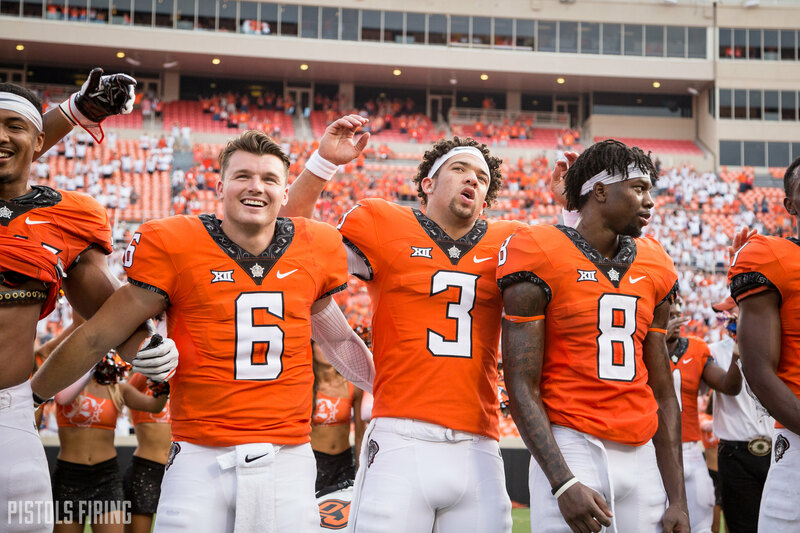 STILLWATER — Dru Brown and Spencer Sanders are still splitting reps in the Cowboys’ spring practices, but a leader could emerge as early as Friday. The Oklahoma State football team will scrimmage Friday, where Sanders and Brown will again split reps and alternate between the first and second teams, but the two will be tasked with more responsibility than their normal practice drills. To this point the two have been locked in a battle to be the Cowboys’ quarterback after Taylor Cornelius’ departure. Friday will be somewhat of a measuring stick to see how far the two have come since coming to Stillwater last year. Both quarterbacks are looked at as dual threat guys but sit at opposite ends of their collegiate careers. Sanders, a redshirt freshman, came to OSU as a highly touted recruit from Texas. He was the state’s Gatorade Player of the Year, receiving the award a few years after eventual Heisman Trophy winner Kyler Murray. Despite his high regards entering the program, he didn’t play a down as a freshman. Brown played only one more down than Sanders did in 2018, a handoff in the Liberty Bowl. Brown is a college football journeyman at this point. He started his collegiate career at the College of San Mateo in 2015, where he threw for 1,879 yards and 21 touchdowns in a triple-option offense. From there, he transferred to Hawaii. With the Rainbow Warriors, Brown started 22 games in two seasons and finished his Hawaii career with 5,273 passing yards and 37 passing touchdowns. The two are similar in areas and different in others. Their time at OSU has been similar thus far, but before too long that could also begin to change.